Okay, I'm playing A Link to the Shadows and I can't get any further. I finished up to lvl 7. So, instead of going into lvl 7 I tried to adventure. Unfortunately, when I visited lvl 8 I'm stuck; I can't get back out. When I tried F6, I hit save by accident and now when I restart I'm back in lvl 8, Link walks up (north) and enter the room above it which is the way to the Boss. Since I don't have the boss key and I can't finish the level. How can I move the ice block in the upper room (to the left) to go down those stairs which will hopefully lead me out of lvl 8? Edited by sctmorgan, 29 July 2009 - 04:37 PM. Where is lv4? I have the wooden sword, boomer, blue candle, bow and arrow and flippers. Have been all over the water but can't seem to find it. Crackers level 4 is to the east then south. It's surrounded by water. I hope you didn't make the same mistake as me stcmorgan because you'll probably have to restart your game. I made the mistake of taking the warp that's north of level 4. It put me in another world where levels 5 ,6 and 7 are but in the process I missed out on several items.The worst thing was that I had to finish both level 5 and 6 before being able to go back to the first overworld. It was too hard so I ended up restarting. 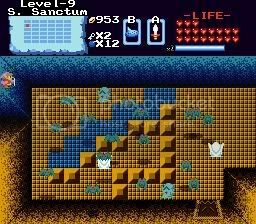 So to anyone who reads this topic.....Don't take the warp that's north of level 4 until you've explored all of the first overworld. I just checked to make sure that my spawn points were set properly, and I didn't notice any issue. When trying to get the first key early I did spawn in the wall, but it was a small walk-right-out issue. Are you sure you're playing the quest in the proper version of ZC? I can't seem to replicate this bug... nor do I exactly know where it occurs, but I believe I have a good idea. Still, a screenshot would better help me troubleshoot the issue. Edited by skateboarder11, 29 July 2009 - 05:32 PM. I still need the 2nd sword. I paid for the hint about it being by a lake but there are a lot water areas. Sctmorgan, in level 5 did you find the way to the warp that's surrounded by blocks? I've been trying to figure it out for 2 days and I just can't. Crackers: Search one screen south of Level 3. Burn the bush on the left side of the screen and claim that sword! Take note of the flame on the wall - this secret is accessible after Level 6. Perhaps I shouldn't have hidden the swords... ah well. Edited by ms_zelda_lady, 29 July 2009 - 07:15 PM. Managed to find both the Super Bomb shop and Magic Sword. In Level 7 now...but I can't figure out where I missed a key, and/or what to do with the Power Bracelet I just got. And how do I reach the Red Ring? Saw it from the other side of a cave, but I can't find any stairs on the surface near there. Edited by Zenith, 30 July 2009 - 11:01 AM. There are different-looking blocks than the ones you've seen in the first six levels thus far - those are pushable only with the bracelet, so my guess is you neglected to check them. As for the Red Ring, caves can be opened by bombing in this quest - try snooping around, and be aware that some hints are rather discreet... I'll say it's in the south part, though. Edited by skateboarder11, 29 July 2009 - 08:50 PM. Make sure you check for suspicious diving spots, especially in the swamp area. Just beat Level 7, but i'm missing 9 rooms. Never ever i can't figure it out how i can reach them. Edited by JPappi, 30 July 2009 - 07:10 AM. The other rooms: You skipped the Magic Boots. Go back to the first room where you see spikes block a door and try to find a different way. Edited by schoochie662, 30 July 2009 - 10:29 AM.